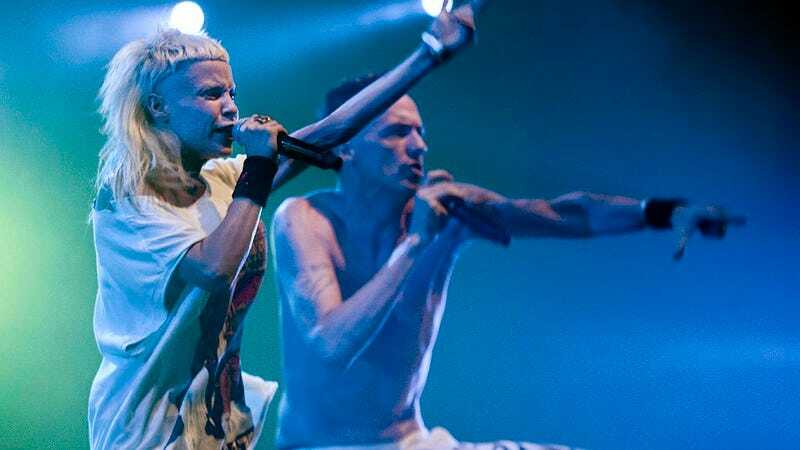 Now that Jared Leto’s Joker exists, the world no longer needs the services of the South African hip-hop weirdos in Die Antwoord. But if you think Ninja and Yolandi Visser and their producer God would just fade away without dropping one more heavy load of hallucinatory rap chaos upon the world, then fink again, friend. Today, the group announced what it says will be its final album, The Book Of Zef, and released the first single off of that album, “Love Drug.” The song, which opens with a catchy chorus of “your love is like a drug” before launching into an all-out electronic assault, comes accompanied by a homemade lyric video full of emoji stickers and hand-drawn pills. Die Antwoord has also announced the dates for what one can only assume will also be its final world tour; you can see those dates below.